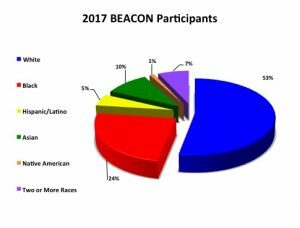 Currently BEACON participants are: 53% White, 24% Black, 10% Asian, 5% Hispanic/Latino, 1% Native American, and 7% two or more races/ethnicities. 37% of BEACON participants are self-reporting as URMs, which is 20.1% above the National Norm (30.8%). Majority of this diversity has been achieved through undergraduate student participation, where 17% (17 of 98) of graduate students and 68% (52 of 76) of the undergraduates (principally REU students) are URM’s; and across the entire consortium, 11% (10 of 90) of the post-docs are URMs. This diverse consortium reflects inclusive efforts that have effectively increased and sustained the number of URM participants.